The Messerschmitt Bf 110, often (erroneously) called Me 110, was a twin-engine heavy fighter (Zerstörer - German for "Destroyer") in the service of the Luftwaffe during World War II. Hermann Göring was a proponent of the Bf 110, and nicknamed it his Eisenseiten ("Ironsides"). Development work on an improved type, the Me 210 that was to replace the Bf 110, begun before the war started, but due to teething troubles, resulted in Bf 110 soldiering on until the end of the war in various roles, alongside its replacements, the Me 210 and the Me 410. The Bf 110 served with success in the early campaigns, the Polish, Norwegian and Battle of France. The Bf 110's lack of agility in the air was its primary weakness. This flaw was exposed during the Battle of Britain, when some Bf 110 equipped units were withdrawn from the battle after very heavy losses and redeployed as night fighters, a role to which the aircraft was well suited. The Bf 110 enjoyed a successful period following the Battle of Britain as an air superiority fighter and strike aircraft in other theatres. During the Balkans Campaign, North African Campaign and the Eastern Front it rendered valuable ground support to the German Army as a potent fighter-bomber (Jagdbomber-Jabo). Later in the war, it was developed into a formidable night fighter, becoming the major night-fighting aircraft of the Luftwaffe. Most of the German night fighter aces flew the Bf 110 at some point during their combat careers, and the top night fighter ace of all times, Major Heinz-Wolfgang Schnaufer, flew it exclusively, and claimed 121 victories in 164 combat missions. 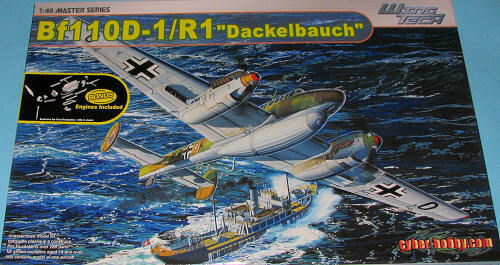 The Bf-110D-1 and subject of this kit was a long-range Zerstörer with a lengthened tail for a rescue dingy. It could carry the very large Dackelbauch long range fuel tank. Coming off their well received 110D-4, Cyberhobby have now produced the earlier C-1 variant. This one differs only in the nose and the inclusion of the very large Dackelbauch long range belly tank. It also does not have the bomb racks or smaller wing drop tanks. Though I've listed all the details below, a few things really struck me. One is that you don't have to build it with everything out in the open as you would with the Eduard kit. CyberHobby has provided a one-piece canopy in addition to the multi-piece version. The nose can be built closed or with the ability to show off the gun compartment. Same with the engines. As you know from the sticker on the box, this initial boxing has two complete engines and an additional instruction sheet if you wish to build your kit with these installed. A real wire HF radio antenna for along the side of the fuselage and a small P.E. fret for the antenna stand-offs, seat harnesses, and DF loop antenna are part of the kit. A superbly detailed interior and much more as listed below. By the way, the smaller tail wheel and tail section for the earlier planes is not in this kit so you can only do a 110D. Instructions are typical for Dragon/Cyber-hobby in that they are quite well drawn and in some cases, rather crowded so one will need to pay attention when building this one. Especially as there are over 280 parts. Markings are for two ZG.76 aircraft in 1941 in RLM 70/71/65. Decals are nicely done and should work superbly. 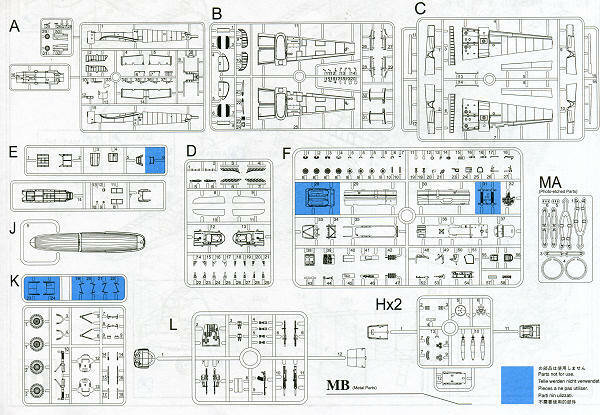 Here is another Fujimi boxing that you can sell off as the Cyber-hobby kit surpasses it in every way except price.